MIM: The Communications director of the AMV is Abdus Sattar Ghazali who runs a website called the American Muslim Perspective (AMP) with is very similiar in format to that of the AMV and espouses an Islamist anti American agenda. MIM:The AMV and AMP websites represent the new "Americanized" version of Jihad which makes use of patriotic symbolism, and the mantra of civil rights as a front for their militant Islamist agendas.The red white and blue all American website format shows how the Islamists are establishing themselves and the 'Kaliphate' i.e., trying to replace the Constitution with the Koran to reach their goal of establishing a " United States of Allah" in order to push their militant Islamist agendas from within. Muslim groups such as the AMV are joining forces with the left as can be seen in the list of groups they are promoting and working with below. We are no longer accepting applications for the 2014 Know Your Neighbor Grant Program. This website will be updated with 2015 information after City Council reviews the results of the program in spring 2015. The Know Your Neighbors Grant Program is program designed to help neighbors better connect with each other while strengthening community and improving the quality of life and neighborhoods in Palo Alto. In 2014, the City Council approved the program on May 5, 2014. A copy of the staff report can be found here. We look forward to updating the City Council in spring 2015 to obtain authorization for the 2015 program. 1. Build sense of community. 2. Develop or renew neighborhood relationships. 3. Encourage interaction between generations and cultures. 4. Develop collaborative partnerships between Palo Alto neighborhoods and the City. MIM: Note the upbeat and enthusiastic tone of the article completely oblivious to the AMV's Islamist ties and agenda and playing into their Kumbaya narrative. It is also important to note that Sundas cynically exploits the timing of Jewish and Muslim holidays to hold the AMV event to make it appear that Muslims are no different from them and Islamic practices are in synch with other religions, a standard da'wa canard. Excerpt from: "Eid Festival brings together residents for Muslim celebration of peace, sharing"
"...The festival will include a free gourmet Pakistani dinner, desserts from around the world, ethnic dress, henna art painting, Nasheed spiritual singing and a photo booth where people can have their picture taken dressed in ethnic attire. American Muslim Voice Foundation, of which Sundas is the founding executive director, is sponsoring the festival. The City of Palo Alto is a co-sponsor through a $1,000 Know Your Neighbors grant." 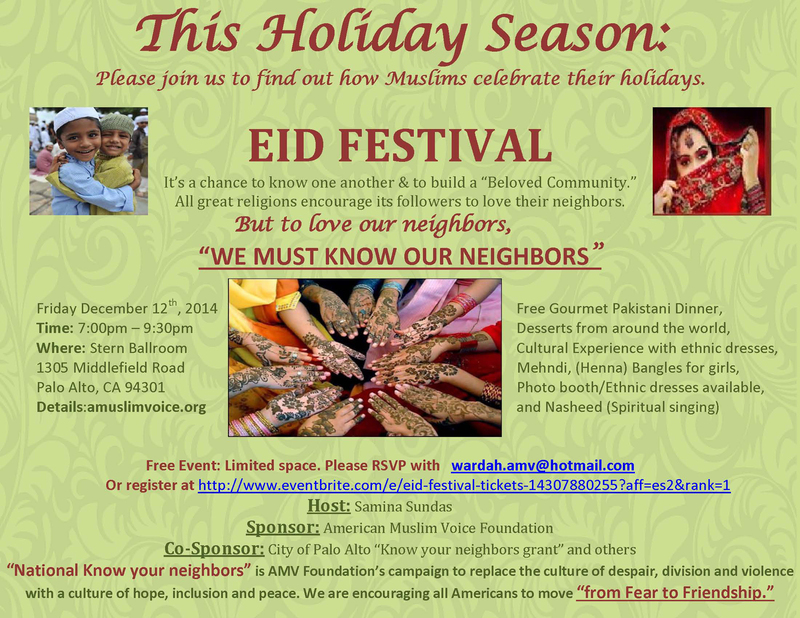 "...Although Eid does not traditionally fall around Christmas and Hanukkah -- in 2014 it began on July 28 -- Sundas hopes that introducing the celebration around the Christian and Jewish holidays will help people to see that Muslims also practice loving their neighbors.,,"
MIM: The AMW blames the Bush administration for spreading nonexistent "Islamophobia" and claims that they as Muslims have to take back the narrative from them by "education" people about the "true meaning of Islam" and do not "want Osama Bin Laden to hijack our beautiful religion". The organisation practices da'wa by interfaith and states that "We no longer can preach Islamic teaching, we must start practicing Islam in our daily lives among our fellow Americans so they can learn about Muslims and Islam firsthand." Our past administration started targeting Muslims, Arabs and South Asians post 9/11. The majority of our fellow Americans were getting information from the administration or the media. Therefore, the Muslims were looked upon as terrorists. We wanted to change the negative perception about the Muslims and Islam. The AMV Foundation was founded in July 2003 to fill that void by educating the world about the true meaning of Islam. We did not want Osama Bin Laden to hijack our beautiful religion. The choice was clear to us; either we tell our own story or the Bush administration, media and a few misguided individuals who claim to be Muslim will tell it for us. We wanted to take the interfaith dialog to the next level by fostering friendships with our fellow Americans. If we want to earn respect as a community, gain political power, protect our freedoms, stop being labeled as terrorists and see Muslim candidates win in elections, then we must provide that essential firsthand experience to our fellow Americans about us and Islam. Since 9/11, there was a thirst for true knowledge about Muslims and Islam. There have been wonderful forums and teach-ins that provided the first step in the right direction but there was not enough time to socialize or form lifelong friendships. No other Muslim organization was focusing on such crucial work so we decided to provide that opportunity and experience to our fellow Americans. When we first started in July 2003, we did not involve the community in that process nor did we ask for any financial assistance from anyone. We wanted to try this idea first to gauge our success in the post 9/11 climate. It has been over eight years now and the results are better than our wildest dreams. Alhamdulliah, we have formed close relationships with dozens of organizations nationwide and have earned respect from major civil rights, human rights, immigration rights places of worship, and from other ethnic and religious groups due to our sincere efforts and results. To see the results of our efforts, please visit our website www.amuslimvoice.org. Go to "Stop the re-registration" to see our efforts against the INS. We were able to build genuine coalitions and worked for a common goal: stopping injustice against Muslims, Arabs and South Asians. We have a model now that we are very proud of. We know with open minds, sincere efforts, hard work, a just cause and the best intentions, we can achieve our goals to foster friendships, build an inclusive and beloved world and change others' opinions about Muslims and Islam from negative to positive. The key is to focus on the cause and goals, and not on personal agenda. We can overcome almost any hurdle if we keep our focus on a bigger picture and not worry about who gets the credit for the work. To succeed as a team, we must overcome personal problems, forgive, and move on. A lot of work gets done when nobody worries about getting credit. Shared leadership, shared responsibilities and shared ownership allow us to utilize resources and collective efforts produce better results. This project has great potential for success. We know that now, and that is the reason we are introducing AMV Foundation to you. We need your involvement and your support. Fighting for civil rights, building real collations, bridging the gap between all communities, forming true life long friendships, protecting human rights and changing the image of Islam and Muslims is a tremendous job which requires mass mobilization, education and support from all of you. That is why we are reaching out to you. We have a few good Muslim organizations but they cannot do this alone, even if they focused just on bridging the gap and forming friendships. It took over six years and 35,000 volunteer hours, thousands of miles of driving, hundreds of community building meetings and overwhelming physical and financial commitment from the AMV Board of Directors. To have these results, we reached out to our fellow Americans in the truest sense of the word. We are at a turning point and have laid down a strong foundation for our future generations but we can not continue do this crucial work alone. We need community support and involvement, funds, a few paid staff members and a paid executive director. We are committed to building a first rate Muslim institution which would train Muslims to invest themselves in their local communities by volunteering and getting involved in the local government. We cannot ignore the need of our community or the need to build institutions for our future generations. This job requires mass mobilization; every American Muslim, Arab and South Asian needs to share this responsibility. Our global peace campaign "The Miracle Movement of Peace and Friendship" is a proactive effort by Muslim, Arabs and South Asians and is building momentum. It will be manageable and more productive by mass involvement from Muslim, Arabs and South Asians. If we are to become first class citizens, then every member of our community old, young, male, female must fulfill our Islamic duty to serve our creator through serving his creation in the land we have chosen to call home. We to be involved in protecting what is precious to us, our country, our civil liberties and freedom to practice Islam freely. Even our kids starting kindergarten can play a role in creating a positive image of Islam and Muslims. We no longer can preach Islamic teaching, we must start practicing Islam in our daily lives among our fellow Americans so they can learn about Muslims and Islam firsthand. MIM: Sundas' first thought on hearing about the September 11th attacks was of how it affected her as a Muslim. She was concerned Muslims would be the victims of a backlash which never materialized and that her religion "had been hijacked". MIM: The AMV website list of Major American Muslim organisations is a Whos Who of all the Muslim Brotherhood terror linked groups in the United States. MIM: The AMW also works closely with a slew of left wing groups which form part and parcel of 'The Red Green Alliance' which helps them operate under the guise of a 'civil rights organisation'. AMV is a civil rights organization. Our mission is to preserve and protect civil liberties and constitutional rights for ALL and our goal is to bridge the gap between all communities.